As difficult as faith is to understand the only thing harder to understand is how important faith really is in our lives. This morning I am writing this sitting on our patio in front of me is a huge tree, I do not need faith to know it is a tree and as I look at the tree and the white clouds moving against the blue sky my belief in God ignites my faith in God’s presence. I cannot see God like I can see the tree, the clouds, and the sky yet because God accepts my belief in his reality in response he gives me through the Holy Spirit the gift of faith and as I exercise the gift of faith my belief in God gives way to experiencing his presence. 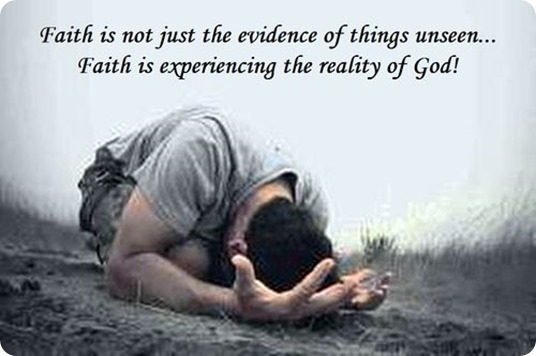 Often we speak of faith as if it is “authored” by us yet R.C. Sproul suggests that faith originates with God not us. “Faith is not seen as an accomplishment of the human spirit. In fact, faith is not something that is naturally exercised by a fallen human being.” (Chapter 3: A Gift from God, “What Is Faith?” page 47, Reformation Trust Publishing) Once God gives us the gift of faith he does not retain its ownership therefore faith becomes ours and with ownership comes the responsibility of its stewardship, its use, and further development.